This is our favorite for the drop-down cover that activates to protects seeds with a squirrel’s weight, and open-air ventilation for seed. The classic design, general safety for birds, low price, and easy of cartridge removal make this our runner-up. Almost anyone with bird feeders knows the struggle of keeping squirrels from hoarding all of the (sometimes expensive) birdseed. While squirrels getting a bit of the nourishment may not bother you to an extent, it becomes a problem when these scavengers consume almost all of the birdseed, leaving nothing for the birds to eat. This can become an expensive issue. If you go through several bags of seed and see the squirrels getting fatter yet the birds are being frightened off by these rodents, it’s time to intervene. This is why we’ve rounded up our favorite squirrel-proof bird feeders on the market right now. Whether you need large capacity, you use suet cakes, or you just want a standard feeder to work well to keep the squirrels off, we have you covered. The Squirrel Buster Standard Wild Bird Feeder with four metal perches comes with a hanger and has excellent customer ratings. We agree. The design of this feeder is sturdy and has an ingenious system of shutting off the supply to birdseed if an animal the weight of a squirrel does manage to get onto the feeder (this includes large birds such as hawks, too). This feeder is dishwasher safe for sanitization. It’s also UV-resistant, waterproof, and chew proof with trademarked material squirrels cannot chomp through. Overall, we found this to work fantastic, and with a capacity of 1.3 pounds of seed, it offers plenty of room for birdseed. Perky-Pet (model number 102) Squirrel Resistant Easy Feeder is excellent in its simple yet effective design. This feeder’s tall, cylindrical-shaped birdseed reservoir is caged in a red metal barrier. This barricade not only presents a comfortable perch for many birds but also guards the feeder against any squirrel damage and helps thwart rodents from getting to any of the 12 seed ports. We love this feeder for the transparent birdseed reservoir which makes it easy to check the seed levels with a glance. Bonus: the clear cylinder lifts out of the metal cage barrier for easy re-filling and cleaning whenever needed. We found this to be a simple yet effective design with a classic look. We adore the design of the Perky-Pet (model number 339) Squirrel Be Gone II Feeder Home with Chimney. The home design construction is both classic and cozy, yet trendy with the rustic chic style of this little “house” and its tin-look roof. 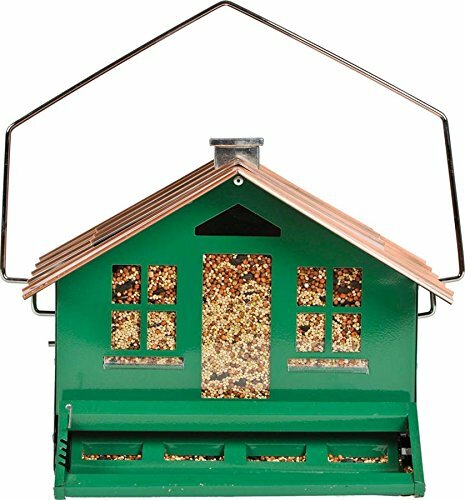 Highly-rated and weighted to shut off seed supply if a squirrel jumps on, this feeder is perfect for those looking for a large capacity bird feeder. When you consider how many pounds of seed this feeder can hold (up to eight full pounds) the price is also very reasonable. It’s easy to monitor the seed levels through the cute windows and clear “door” of the house, and the large capacity makes refilling this birdfeeder a job that needs to be done far less often. Made of metal construction and the roof is removable for filling and cleaning. 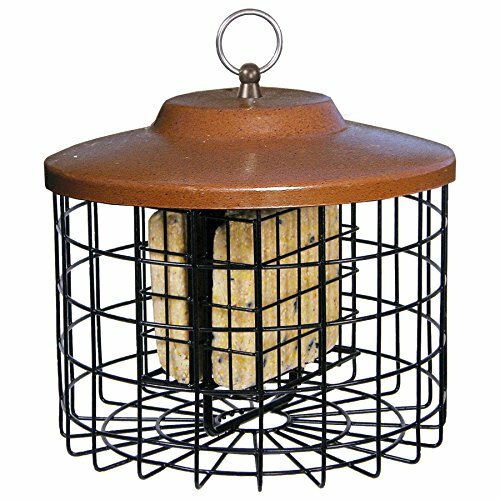 The Stokes Select Squirrel-X Squirrel Proof Suet Bird Feeder comes in an attractive natural brown color. The design of this feeder is appealing to many bird varieties, and it features four ports to provide sufficient feeding areas for the birds. The opening mechanism of this suet feeder is constructed to deter squirrels from intruding and is guarded with a metal cage. Yet it’s simple for bird enthusiasts to fill and clean the interior. The entirely open-air construction of this caged feeder allows you to see feed levels and prevents mold growth on suet cakes. As with all bird feeders, for maximum squirrel deterrence, hang them with a clearance of at least 18 inches from both the top and any sides of trees or hooks squirrels can climb. Squirrel deterrents to keep them from your yard in a more general sense. An extra step to help keep squirrels out of your bird feeders is to fill them primarily with seed birds enjoy, but squirrels dislike. Some of these seeds are safflower (which attract birds such as cardinals and chickadees), nyjer thistle (which goldfinches love), or a birdseed blend that contains a significant amount of white millet seed (which is excellent for mourning doves and house finches). You can also hang feeders on a thin wire that is strung between two points and put a slippery plastic baffle on top of any of these feeders. Be sure the feeder it high enough off the ground and far enough from any trees or decks that squirrels could use as a launch pad to jump onto your feeder. A minimum of 18 inches is an excellent place to start. If you find the squirrels can still reach your feeder, hang it with more distance between squirrels and their jumping point. Additionally, consider squirrel deterrents to keep them from your yard in a more general sense. Numerous ultrasonic devices and anti-rodent sprays are on the market that can work well and are also often made from non-toxic, environmentally-friendly blends. Nourishing birds with a feeder is not only enjoyable to watch as songbirds and brightly colored cardinals, oriels, and blue jays stop by. It is especially important to offer birds food during winters, especially those that are incredibly frigid. Migrating bird species can end up returning to snow-covered soil during harsh, long winters, so having seed available is a great thing to do for our feathered friends. One concern with bird feeders other than squirrels is that of potential diseases birds that do not typically interact with each other might encounter from various species. Experts say it’s still important to feed birds, but just to take precautions to keep your feeders clean. Stephen Kress, the director of Audubon’s Project Puffin, claims safe bird feeding includes scrubbing out bird feeders with either a 10 percent non-chlorine bleach, 90 percent water solution at minimum a few times a year, and always between seasons. If you don’t like to use bleach, a half vinegar half water mixture is another option. Keeping your feeders safe also means researching the preferred seeds of the fowl species you would like to attract. With just a little maintenance on your feeders, selecting the right seeds, hanging them correctly, and if you have squirrel problems, buying the right birdfeeder can make a world of difference. Rather than looking out your window and getting frustrated as you watch a squirrel hoarding all your freshly replenished seed, a little research and the right equipment can result in a calming view of lovely birds in your yard.